Please scroll/swipe down through this page to find out more about us, in addition to the pages linked in the menu, top-left. Family Fun. Free egg for each entrant. Lots of other eggs to claimed and other special prizes. 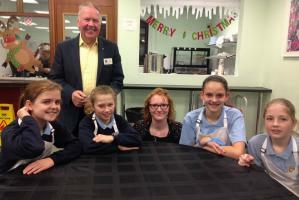 The adventure continues for Stoke Golding’s Young Speakers. 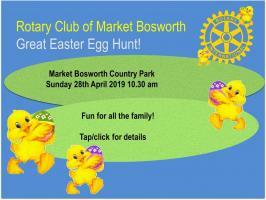 You are invited to join us on Sunday April 28th for our Great Easter Egg Hunt in Market Bosworth Country Park. Fun for all the family. A free egg for each entrant and lots more to be discovered in the hunt. Also a special prize for the best Easter bonnet or hat and a draw for a Super Egg. For details click/tap here, and for an entry form, click/tap here. On 26th February we distributed just over £4000 to 14 charities and youth groups. At a specail dinner we invited each of the recipients to give a brief description of their work before presenting them with their cheque. Details will be found here. A big thank you to all who donated so generously to our Santa Sleigh and other events over the Christmas period. For more information about our events either click in a picture as it appears at the top of the screen or use the "What we do" and then "Community" drop-down menus. Select events to view from the list at the right-hand side. Slideshows can then be seen for most events. Or look for us on Facebook. We are a small, friendly, club with members from Market Bosworth and surrounding towns and villages. The Market Bosworth area is steeped in history. The Battlefield of Bosworth on which King Richard III was killed by the forces of King Henry VII in 1485 is just down the road from our meeting place. Using the menu at the top of the page, you can find out more about what our club does, including up-to-date information about our weekly meetings. We are a part of Rotary International, which is the world's largest service organisation for business and professional people. Click the button in the picture below to see the range of Rotary's activities. If you are a Rotarian visiting the area, you will be made most welcome at one of our meetings - check the programme page for further details. Click the 'meeting information' tab, right, to get detailed directions on how to find our meeting place. If you're interested in joining the Rotary Club of Market Bosworth, please make contact, using the link at the foot of this page, and we will arrange for you to visit.